Outsider has released the video for his brand new single 'Míol Mór Mara', out now through Warner Music's W Songs. 'Míol Mór Mara' premiered with Hot Press who said, "Outsider has also treated us to both a stunning and fitting video accompaniment. Following the journey of a lady disillusioned with her mundane life, we see her rebel, change her path and walk against the crowd to find fulfilment. Showcasing some of the breathtaking and almost wondrous land and seascapes of the Emerald Isle, it is beautifully shot and is at once symbolic and inspiring." The video is filmed in the singer's Irish homeland and captures the stunning landscapes of the West of Ireland, Connemara, Dromore and The Kesh Caves in Silgo. Its subject matter is influenced by the lyrics of 'Míol Mór Mara', which are in turn inspired by the works of Joseph Campbell and Karl Jung. Regarding the video Outsider says, "The video for 'Míol Mór Mara' is the story of a girl who is going through the motions in life, working the same repetitive job, being a corporate slave. The girl is mysteriously drawn towards the ocean, by an unknown spiritual voice. It stars the actor Brigid Leahy who is of Irish, American and Vietnamese descent. She understood the concept deeply and delivers an incredible performance." 'Míol Mór Mara' features the Irish singer, songwriter, multi-instrumentalist and punk poet employing driving guitar and bold vocals, reminiscent of the likes of Bruce Springsteen or The War On Drugs. 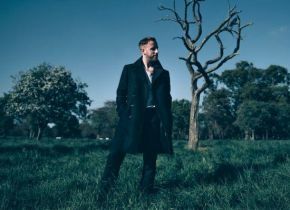 Featuring lyricism in both English and Gaeilge, which come from his Irish heritage, the Dublin singer also pulls together orchestral strings and a punk-influenced rhythm on the new single. 'Míol Mór Mara' means 'sea whales', and translates literally into English as 'giant beasts of the sea'. Talking about the single Outsider says, "The song is about a child with downs syndrome I worked with when I was suffering from huge heartbreak and it had a profound influence on my life. The kid was so inspiring and pulled me out of a dark place really just by spending time with him. It's got a lot of biblical references to Jonah and The Whale, which is symbolic of diving into the sea of the unknown and becoming something far greater than yourself in a spiritual sense." The song is featured in the soundtrack of FIFA '18, and marks the first time ever that the Irish language has been introduced into mainstream video gaming. His music has also recently been featured in the Netflix's Shadowhunters. Outsider takes his name from the song by the Ramones and Colin Wilson's controversial book The Outsider. His songwriting is deeply thoughtful and enticingly intelligent, matched by rich Americana-tinged guitar music, is set to captivate hearts and minds across the globe.